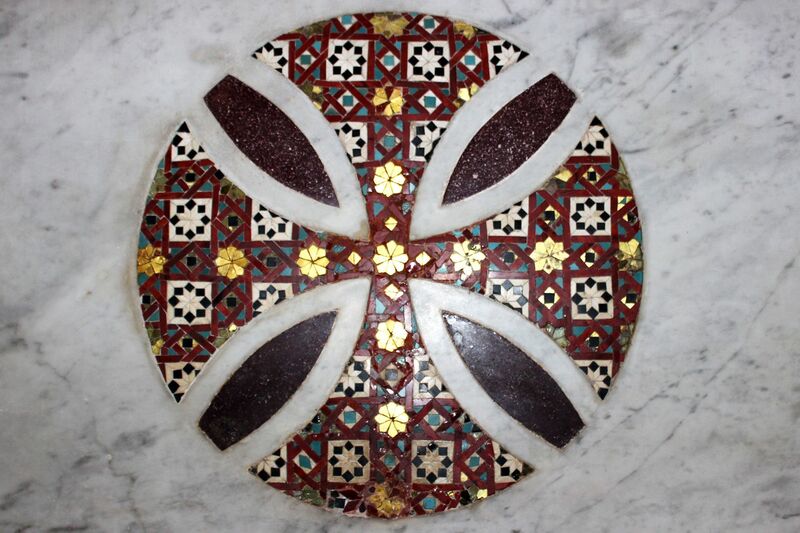 Dedicated to St. Peter, the chapel is one of the most beautiful examples of the harmonious mixture of Byzantine, Arabic and Norman architecture as well as decorative arts. It reflects the abundance and splendor of life in Norman Royal court but at the same time shows deep religious beliefs of Norman kings. 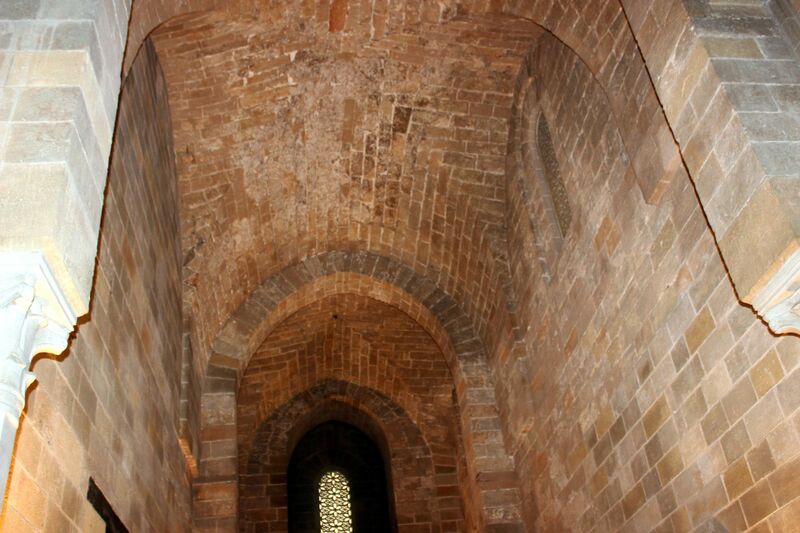 The rectangular floor-plan with transept is an example of the Romanesque architecture and Latin (Rome) influence. 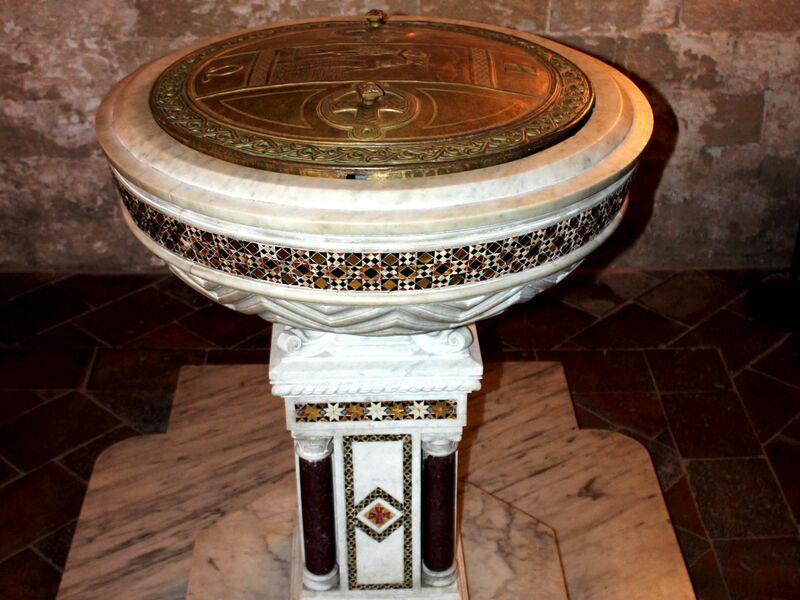 However the large dome is typical of Byzantine architecture. 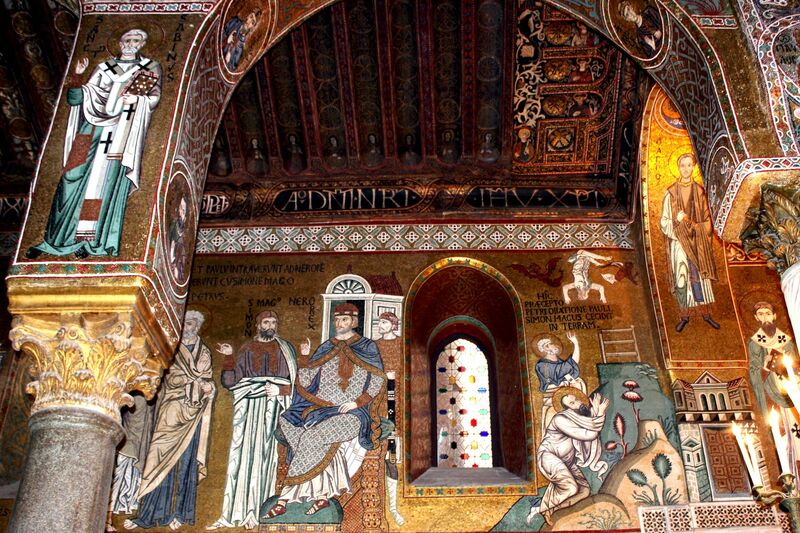 Mosaics speak for themselves – their style and vibrant colors with abundance of gold are overwhelmingly Byzantine. 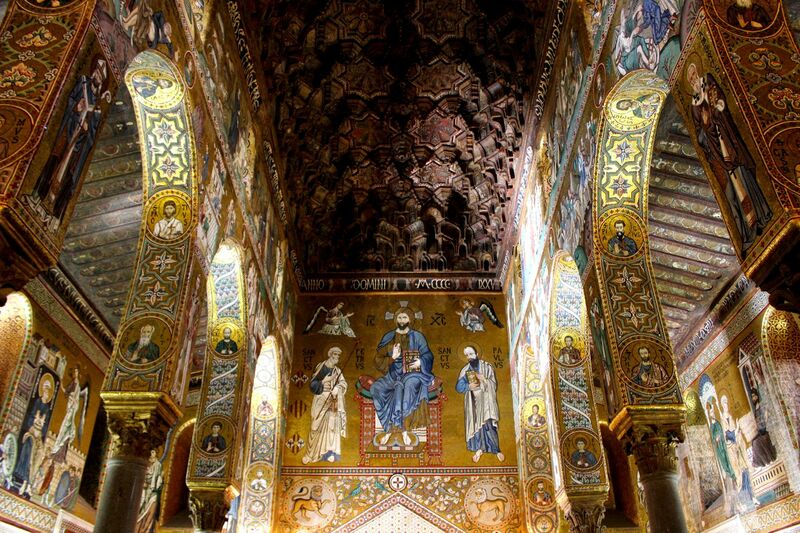 Finally, the beautiful wooden ceiling is a masterpiece of Islamic art from the period of Fatimid Caliphate…..
Palatine Chapel is probably the best evidence of magnificence and lavishness of life in Norman Royal Court in Sicily. It was built in 1130’s as the integral part of the Royal Palace for the private use of the royal family. 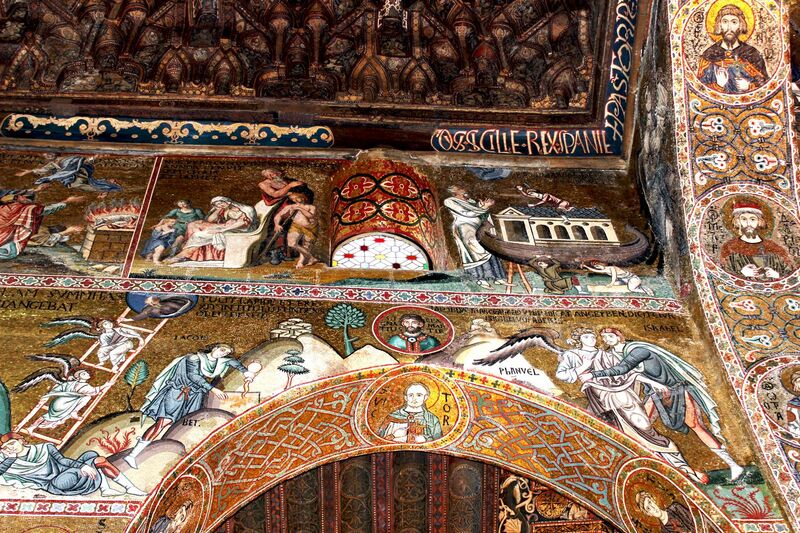 The chapel harmoniously combines the best of Byzantine, Norman and Islamic architecture and art proving the fact that “acceptance of differences” is a source of enrichment. 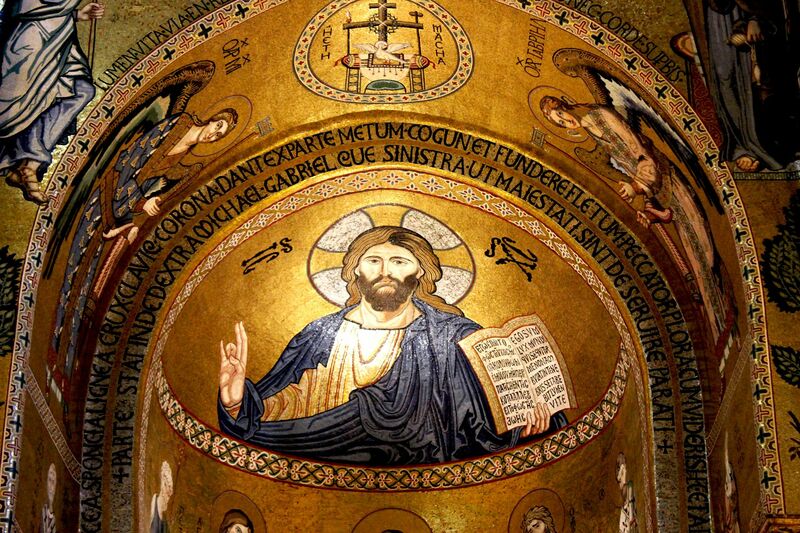 The large mosaic icons of Christ Pantocrator in the main apse and dome above the apse are distinctively Byzantine. 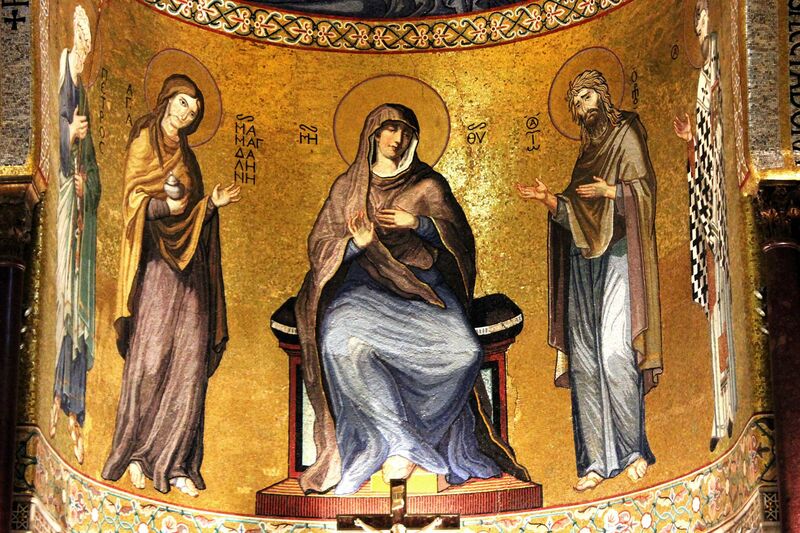 These are the oldest mosaics in the entire chapel, probably dating to 1143 – the year of consecration. 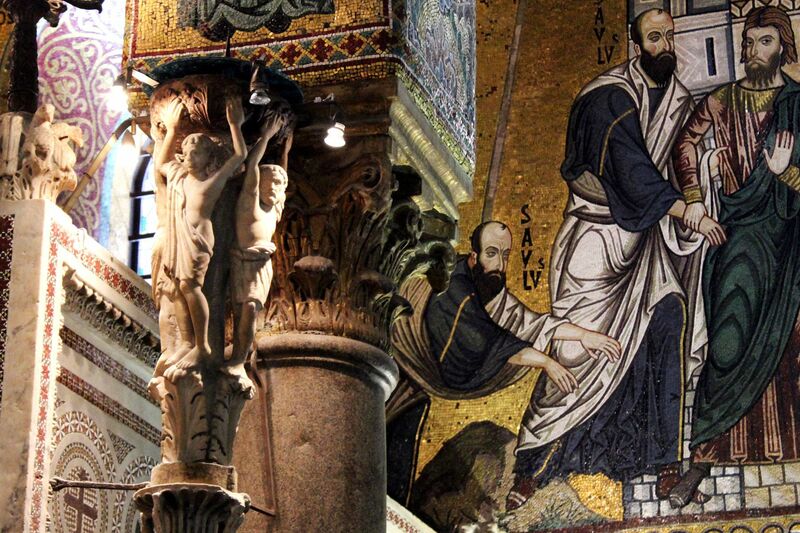 Noteworthy are also mosaic icons of St. Peter and St. James. 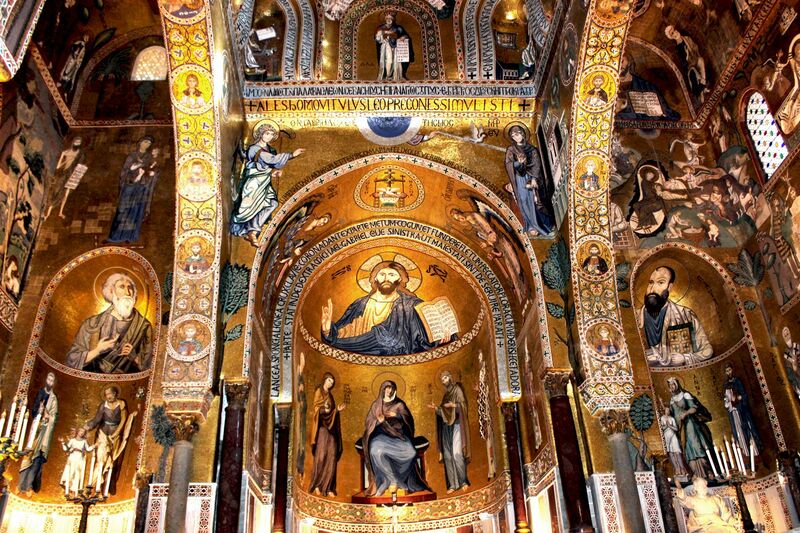 Similarly, beautiful mosaics in transept displaying biblical scenes, saints and fathers of the church (St. Gregory of Nyssa, St. Gregory the Theologian, St. Basil, St. John Chrysostom and St. Nicholas) are great examples of Byzantine religious art. Remaining mosaics along the nave (probably from 1170’s) - while clearly in Byzantine style show Latin inscriptions instead of expected Greek ones – a visible influence of Rome. 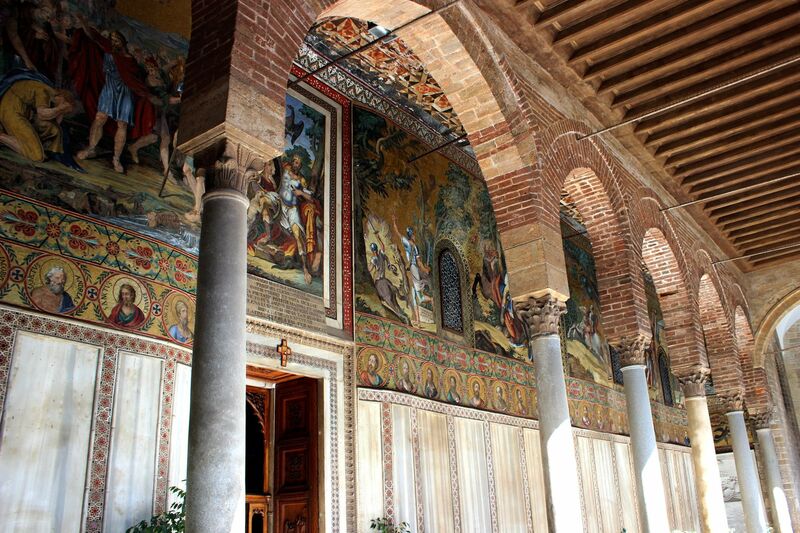 Striking with vividness of colors are also scenes painted outside of the chapel on the entrance wall. While they make an impression on visitors – they are only 19th century additions to the Royal Chapel. The arches separating the nave from aisles are supported by columns crowned with Corinthian capitals. 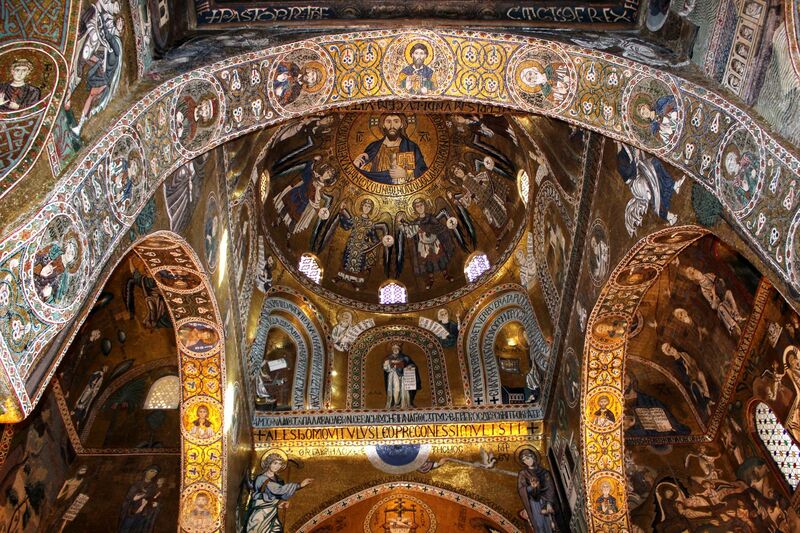 The monumental balcony in malachite, porphyry and gold on the right side of the nave allowed kings to participate in the mass in “privacy”. Next to the balcony stands an impressively tall, elaborately carved in marble 12th century Paschal Candelabrum….. 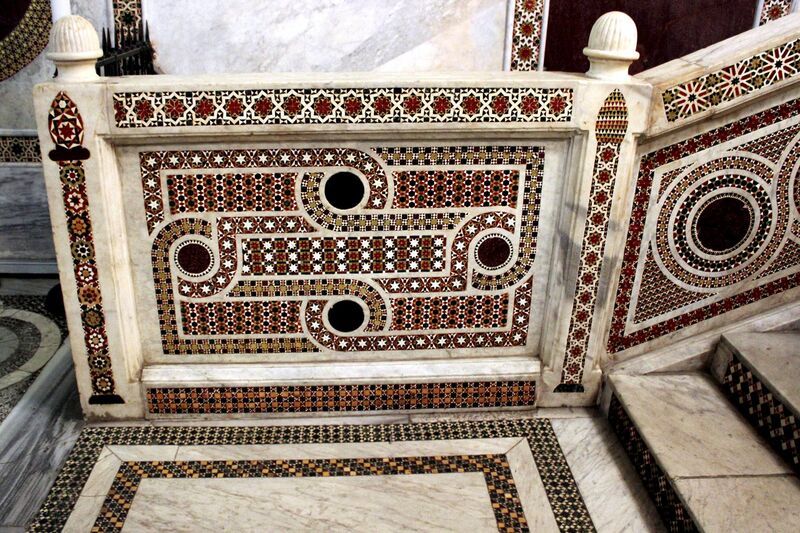 While the Byzantine style of mosaics is overwhelmingly evident across the Chapel, the Arabic influence cannot be ignored. For example frequent motifs of plants, flowers and animals intermingled with Byzantine-style Icons reflects typical Arabic ornamentation. 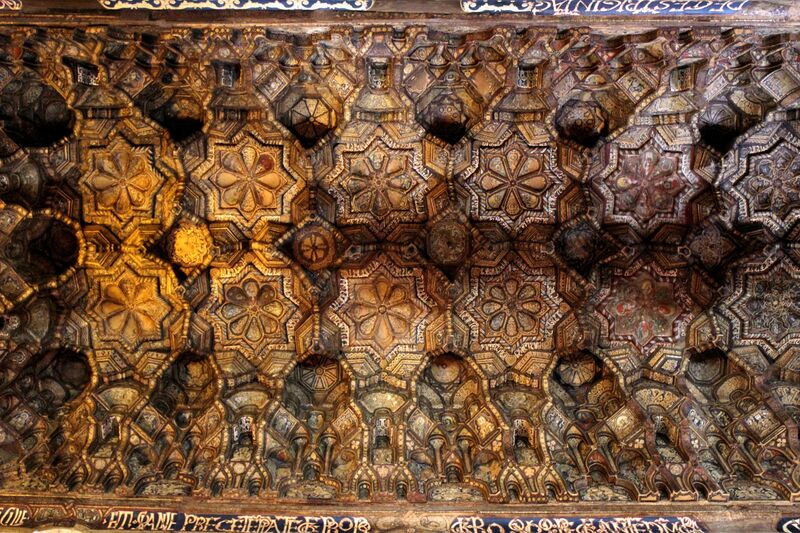 But the best example of Islamic art is the splendid honeycombed ceiling. 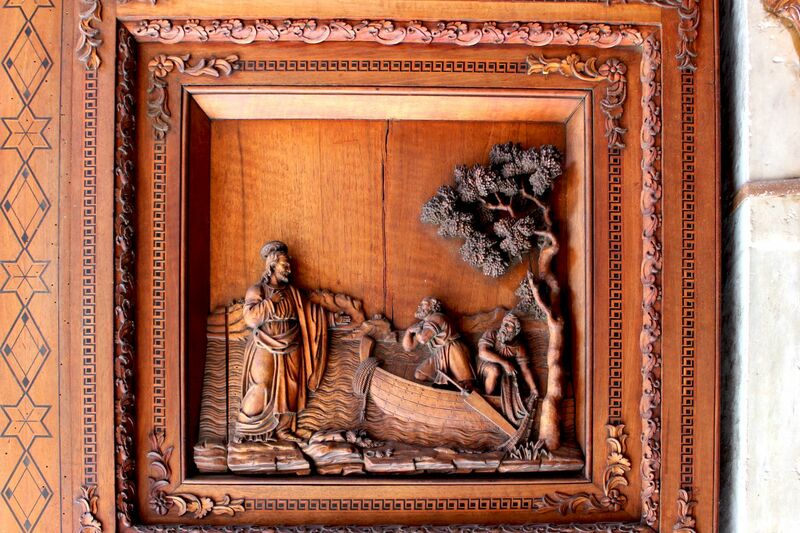 It is formed from three-dimensional cells carved in the wood in a pattern of stars and crosses and covered with Islamic style paintings and Arabic inscriptions. 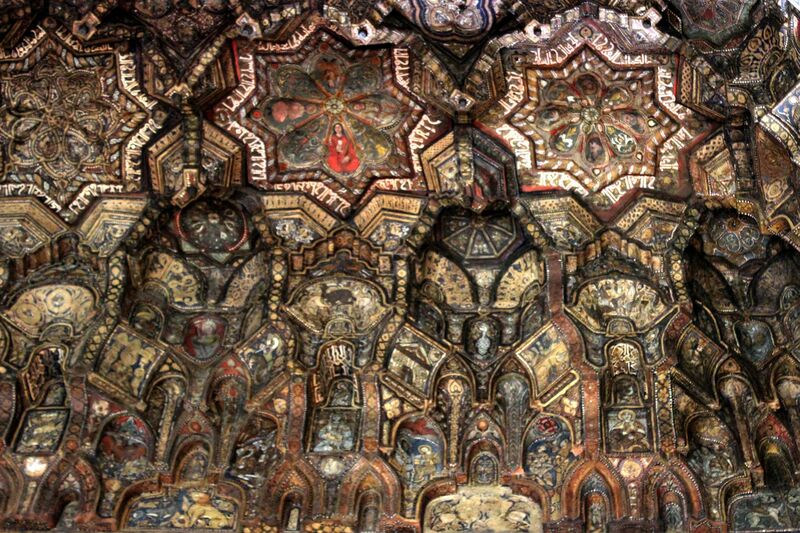 Actually, it is one of the oldest surviving ceilings of such beauty, representing the best of artistic work from the peak of Fatimid Caliphate. It has no match even in the Islamic world. Interestingly, this Islamic masterpiece also displays scenes of life from Arab and Norman courts (dancers, musicians, hunters….) - what is generally prohibited by Islam. Such “contamination” was probably possible only because Sicily was on the periphery of the Arab world. 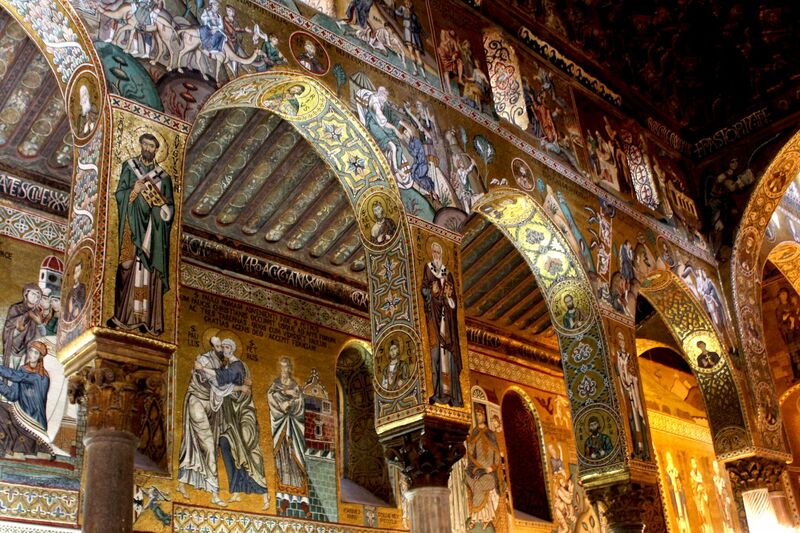 But the end effect is remarkable - the Palatine Chapel shows the greatness of religious tolerance and openness that unfortunately vanished in our times. Actually the fact that the Islamic ceiling crowns the magnificent Christian church should be an example of what religious tolerance can offer to all of us.